Use this table to understand your company's group insurance including members, dependents, and corresponding costs. Estimated Premium: The total cost of the health insurance, including both employee and employer contributions. Company Contribution: The total cost to your company for health insurance per month, based on your contribution strategy. Employee Deductions: The sum of all deductions taken from your employees to pay for their premiums. This amount is removed from your team’s wages pretax and left in your company account so that you can pay the carrier directly. Benefits: A list of each employee’s plan selection for each benefit offered. Effective Date: Your coverage applies to all enrolled employees during this time frame. Treatment received outside of these dates will not be covered by this policy. Employee Monthly Premium: A breakdown of premium cost per employee per benefit. The bottom row is a sum of all benefit premiums per employee. Dependents Monthly Premium: If your employees have any dependents on their insurance policies, you’ll see the cost of the dependents’ premiums in this column. Total Monthly Premium: The total premium cost for both the employee and any dependents on the policy. 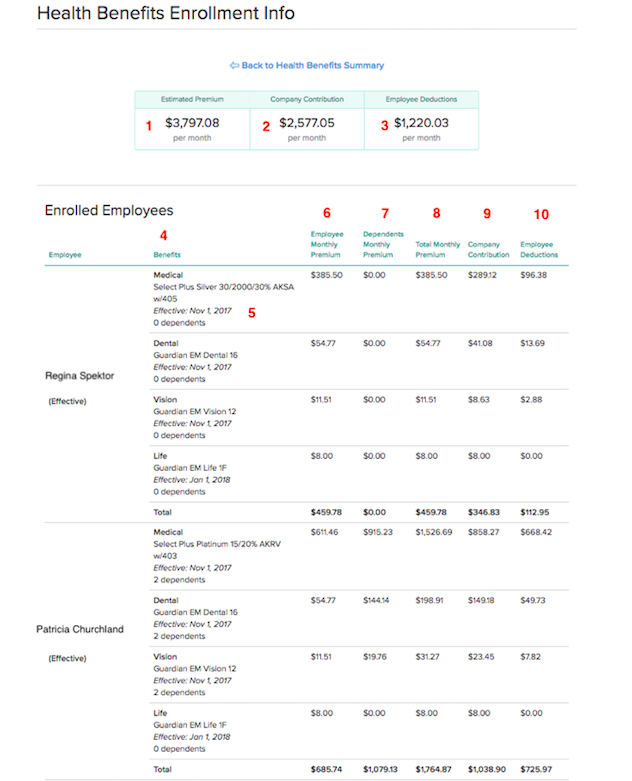 Company Contribution: A break down of the cost to your company for each benefit per employee. Employee Deductions: This number reflects the pre-tax deductions that are applied to each enrolled employee per month. This money is left in your company account so that you can pay the carrier directly. Note: This is relevant to companies who have benefits with Gusto. If your benefits are managed externally, you will not see this table.